One of the most agonizing moments in Academy Awards history came with a dramatic pause. 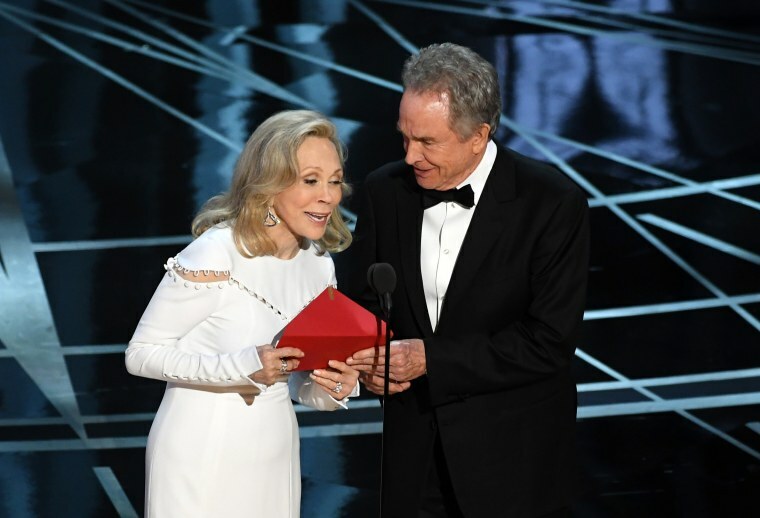 “He pulled the card out of the envelope and he didn’t say anything,” actress Faye Dunaway told NBC News' Lester Holt in an exclusive interview aired Monday, recalling the mix-up that led her and Warren Beatty to briefly name "La La Land" as the best motion picture of 2017. They should have said "Moonlight," of course, but the pair was given the wrong card with the wrong category. Beatty then handed the card to Dunaway, who didn’t bother investigating further — "nobody thinks to look [at] what the category is," she said — and promptly read "La La Land." It wasn’t until Dunaway heard a loud voice from the left — "No, you didn’t win" — that she realized something was wrong. On stage, Dunaway said, she was stunned and confused. Later, she felt guilty. Later, Dunaway said, she asked Beatty why he gave her the wrong card. “He said, ‘Well, I — y —,'" she said. "I don’t know what his answer is."